In support of the Canada-wide Day of Action to Stand With Tim Hortons Workers and the Fight for 15, join Saskatchewan Fight for 15 for petition blitzes in Regina and Saskatoon! Saskatoon: Click here for the Facebook event. Regina: Click here for the Facebook event. There are three sites/times. Come just for an hour if you like, BUT COME – anything helps Saskatchewan workers get that much closer to a living wage! – Team 1, outside Cornwall Centre, 9:30am – 11:00am. Meeting outside the BMO at 1800 Scarth Street at 9:30. Find Aina Kagis (306-527-2014) for materials when you arrive. – Team 2, UofR campus, 9:30am-2pm. Meeting in the Riddell Centre. Find Nick Day (306-526-8708) for materials when you arri…ve. – Team 3, outside Cornwall Centre, 5pm-7pm. Meeting outside the BMO at 1800 Scarth Street at 5. Find Nick Day (306-526-8708) for materials when you arrive. Come petition and leaflet with us! A quick FYI – When Ontario’s minimum wage increased to $14 on January 1, 2018, Tim Hortons began to cut workers’ paid breaks, reduce access to basic drug and dental benefits, eliminate uniform and drink allowances, and even cut employees’ hours of work. This is outrageous coming from a wildly profitable multinational corporation. • In 2016, Tim Hortons generated US $3 billion in revenue for its parent company Restaurant Brands International (RBI). • That same year RBI CEO Daniel Schwartz pocketed $6,640,150 in salary, stock options and other perks. • An additional US $350 million in profits were given out to shareholders. This is not right, and it’s downright greedy. It’s time to take action. Join us and fight for 15! Fight for $15 and Living Wages! Activism in the community, on campus, and in the workplace. 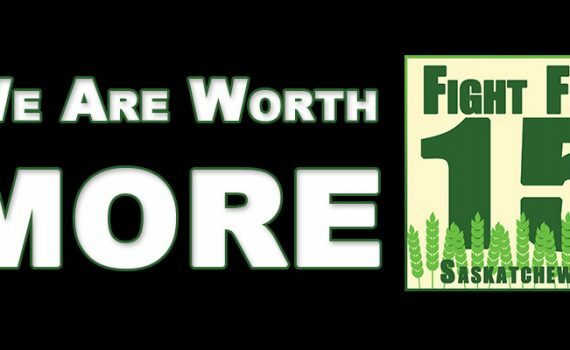 As the Fight for $15 and Fairness builds momentum throughout Canada, workers, unions, students, and community members in Saskatchewan need to learn more about this important movement. Join rank-and-file organizers from Unifor, Fight for 15 Saskatchewan, the York Fight for $15 and Fairness, and local anti-poverty activists to find out how you can fight for economic justice in your community.